Across in the UK, Europe and the US you’d be forgiven for thinking the world was absolutely hunky dory. For the most part stocks in the developed world (excluding Japan) were up well over 1% and in the case of the FTSE 100, an astonishing 2.89%, in March. Goes to show what a little faith can do, given the turmoil surrounding Brexit, the US-China trade talks and sundry other travails afflicting everywhere from France to Italy. As you can see from the table, the first quarter of 2019 has seen fabulous gains across the board. Emerging markets are up 9.56% for the year, maybe reflecting some confidence in the sector after a spate of not very heartening news in the developing world. Here in South Africa, markets were a little more subdued. The JSE All Share index eked out a 0.8% gain, contributing to a fairly healthy 7.1% rise for the first three months of the year. Property continued to be a drag, down 2.7% in March and basically flat for 2019. Bonds were steady, up just 1.3%, perhaps showing some nervousness about the SA Reserve Bank decision on interest rates on March 28. As it turned out, we had nothing to fear, with the repo rate kept unchanged. Bonds have risen 3.8% this year, what many people might think is an unexpected development. Other good news in March was that rating agency Moody’s held its fire on delivering a downgrade - at least until the post-election ANC shows some commitment to reining in debt, fixing the parastatals and stimulating growth. On the JSE, we continue to see support for basic materials companies. Rising 3.13% in March, basic materials are by far the local stock exchange’s best performer for 2019, up 16.15%. Technology stocks were the standout sector for the month, with a 9.32% gain. Buoyed by better news coming from MTN, the telecommunications sector showed a nice 2.64% turnaround after an indifferent January and February, which contributed to an overall loss for the quarter of 4.5%. 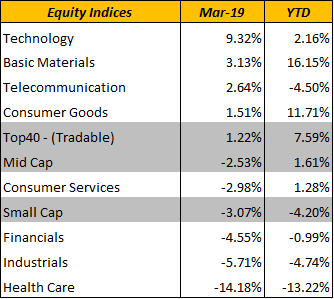 It is worth noting that consumer goods stocks are up nearly 12% for 2019, and another gain of 1.5% in March might suggest some strength in the sector. Leading the downside on the JSE was the troubled healthcare sector, down 14.18% for the month and 13.22% for the year to date. Industrials and financials, too, continued to suffer. 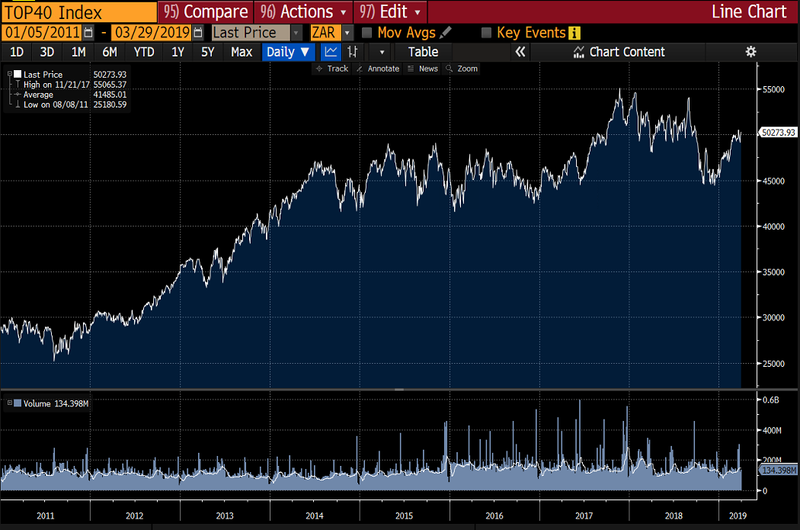 On the latter point, word is that value-hunting fund managers may just be starting to accumulate beaten-down companies that, after all, continue to show resilience in the face of a daunting South African consumer and business slowdown. It was perhaps no surprise that the leading stocks during March were all operations with substantial offshore interests. The table shows the likes of British American Tobacco (up 16.8% in March and 27.4% for the quarter), BHP and Sasol all enjoying strong rallies. Naspers again showed its power in March, even after hiving off MultiChoice as a standalone listed entity. Investors piled into MultiChoice in March, driving it up nearly 15%. Strong performances by basic materials companies boosted performance for the month to 1.73%, dampened slightly by financials. The portfolio was steady for the month, up 0.43%. Top performers were Naspers (+9.4%) and Exxaro (+8.3%). On the downside were Absa (-15.8%) and Mr Price (-12.2%). Most of the bundles were up over 1% in March, beating the JSE All Share index. 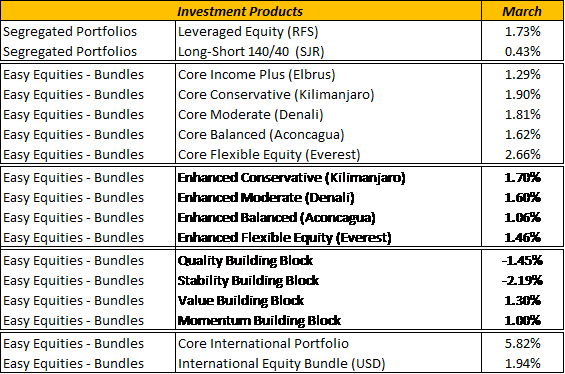 Please note the addition of two international bundles in the table - one denominated in rands and other in dollars. The dollar bundle was up 1.94% in March and year-to-date has gained 16.09%, handily outperforming the MSCI World index (+11.88%). The JSE Top 40 index closed the month at 50,274, building on the gains made since December 2018. As you can see from the chart, we are by no means out of the woods after a disappointing period of choppiness dating all the way back to 2014. For now, the target remains 55,000, a resistance level we would be happy to hit at this stage! The outlook for April hinges on the usual macroeconomic and political suspects, including the noisy buildup to the May 8 elections. And perhaps just as importantly, on the continuation of reporting season in the US. According to the Financial Times, S&P500 companies reported a 4.6% decline in earnings per share in the first quarter, and analysts expect a further fall of 0.4% in the three months to June. So far these dismal figures have not reflected in the stock market, so we can just hope that investors see through the bad patch and are buying for brighter days ahead. This document is for information purposes only and does not constitute or form part of any offer to issue or sell, or any solicitation of any offer to subscribe for or purchase any particular investment. Opinions expressed in this document may be changed without notice at any time after publication. We therefore disclaim any liability for any loss, liability, damage (whether direct or consequential) or expense of any nature whatsoever which may be suffered as a result of or which may be attributable, directly or indirectly, to the use of or reliance upon the information. The value of participatory interests may go down as well as up and therefore is not guaranteed. The past performance is not necessarily a guide to the future performance. Emperor Asset Management is an authorised Financial Services Provider FSP 44978.